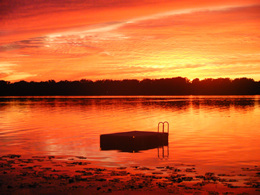 Swim Clubs, Scout camps or private use, when it comes to user-friendly waterfront applications, nothing beats SuperDeck. You can use one product for all waterfront applications: SuperDeck is ideal for beach access on land and floats on water to provide a surface for swimming, boating, fishing, and walking. 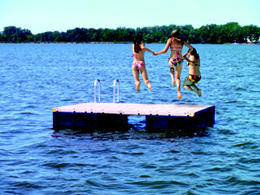 Finally a swim platform that is durable, stable and safe. Made of long lasting polyethylene, SuperDeck Swim Platforms stand up to severe weather and won't splinter, warp, crack or rot. If you are looking for a premiere swim platform that everyone will envy, give us a call. 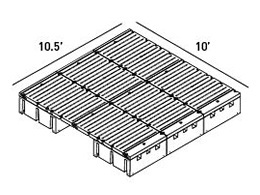 Because of our modular construction, our swim platform can come in any size, but the two most popular sizes 10ft x 10.5ft and 10ft x 7ft. Our platforms are such a natural choice; they're used by marine wildlife professionals for working with Orca whales and other water and wildlife. Water, debris, plant and wildlife to pass through underneath the dock.